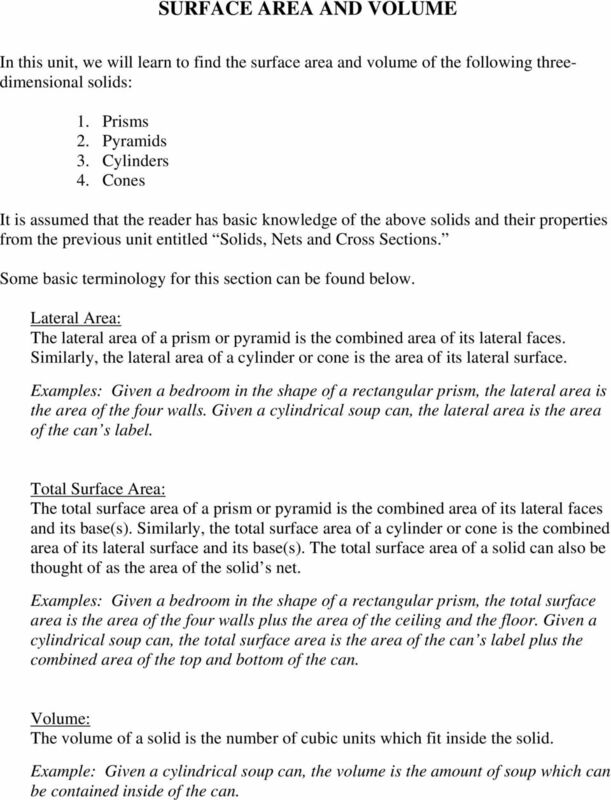 Download "SURFACE AREA AND VOLUME"
1 SURFACE AREA AND VOLUME In this unit, we will learn to find the surface area and volume of the following threedimensional solids:. Prisms. Pyramids 3. Cylinders 4. Cones It is assumed that the reader has basic knowledge of the above solids and their properties from the previous unit entitled Solids, Nets and Cross Sections. Some basic terminology for this section can be found below. Lateral Area: The lateral area of a prism or pyramid is the combined area of its lateral faces. Similarly, the lateral area of a cylinder or cone is the area of its lateral surface. Examples: Given a bedroom in the shape of a rectangular prism, the lateral area is the area of the four walls. Given a cylindrical soup can, the lateral area is the area of the can s label. Total Surface Area: The total surface area of a prism or pyramid is the combined area of its lateral faces and its base(s). 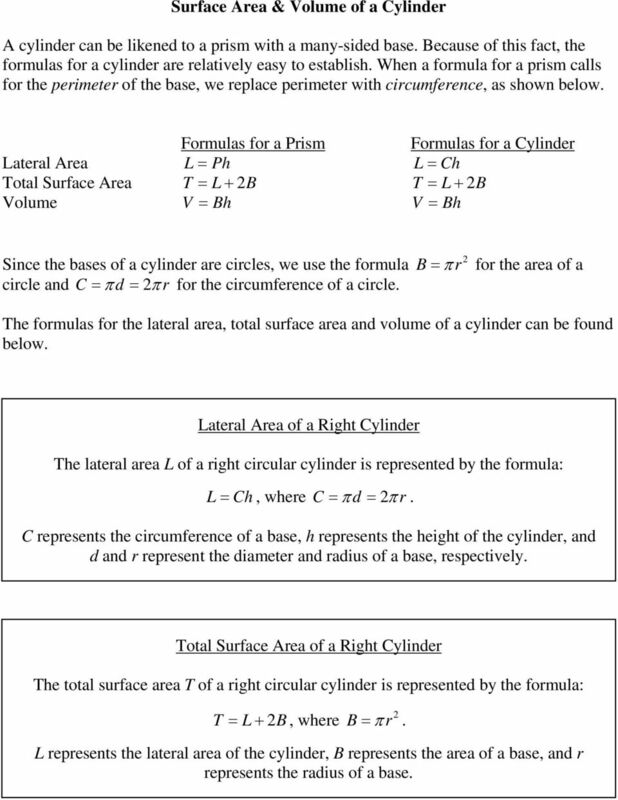 Similarly, the total surface area of a cylinder or cone is the combined area of its lateral surface and its base(s). The total surface area of a solid can also be thought of as the area of the solid s net. Examples: Given a bedroom in the shape of a rectangular prism, the total surface area is the area of the four walls plus the area of the ceiling and the floor. Given a cylindrical soup can, the total surface area is the area of the can s label plus the combined area of the top and bottom of the can. Volume: The volume of a solid is the number of cubic units which fit inside the solid. Example: Given a cylindrical soup can, the volume is the amount of soup which can be contained inside of the can. 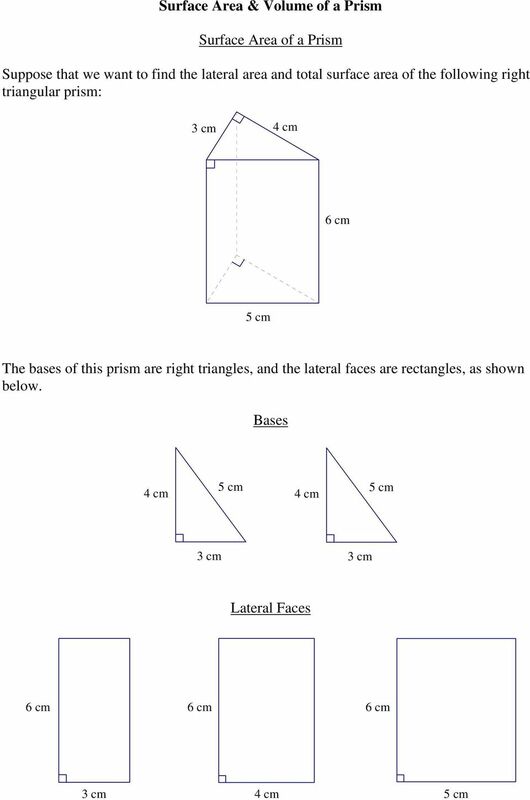 3 The lateral area of the triangular prism is the sum of the areas of the lateral faces; i.e. the sum of the areas of the three rectangles. Lateral Area = 3( 6) + 4( 6) + 5( 6) = = 7 cm The total surface area of the triangular prism is the lateral area plus the area of the two bases. Total Surface Area = Lateral Area + Area of Bases = 7+ ( 3)( 4) + ( 3)( 4) = = 84 cm There is a bit of a shortcut for finding the lateral area of a prism. In the equation for the lateral area, notice that we can factor out a 6: Lateral Area = 36 ( ) + 46 ( ) + 56 ( ) = ( ) 6cm In the formula above, ( ) represents the perimeter of the base, and 6 represents the height. 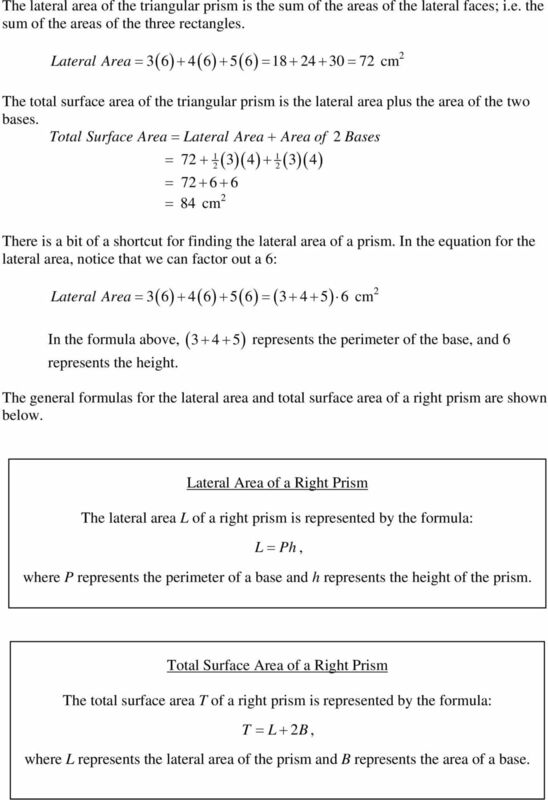 The general formulas for the lateral area and total surface area of a right prism are shown below. Lateral Area of a Right Prism The lateral area L of a right prism is represented by the formula: L = Ph, where P represents the perimeter of a base and h represents the height of the prism. Total Surface Area of a Right Prism The total surface area T of a right prism is represented by the formula: T = L+ B, where L represents the lateral area of the prism and B represents the area of a base. 4 Examples Answer the following. Be sure to include units. (Figures may not be drawn to scale.). The following figure is a rectangular right prism. In a rectangular right prism, any set of opposite faces can be considered to be the bases (since the bases of a prism are defined to be the polygonal faces that lie in parallel planes). 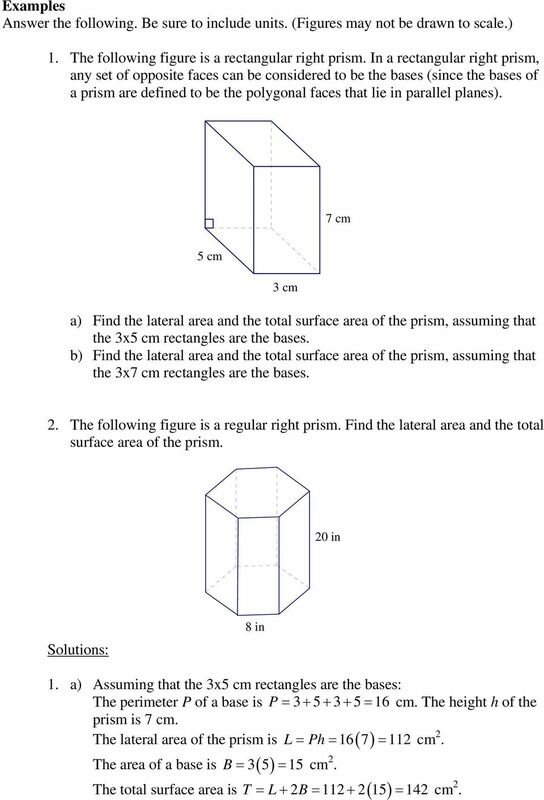 7 cm 5 cm 3 cm a) Find the lateral area and the total surface area of the prism, assuming that the 3x5 cm rectangles are the bases. 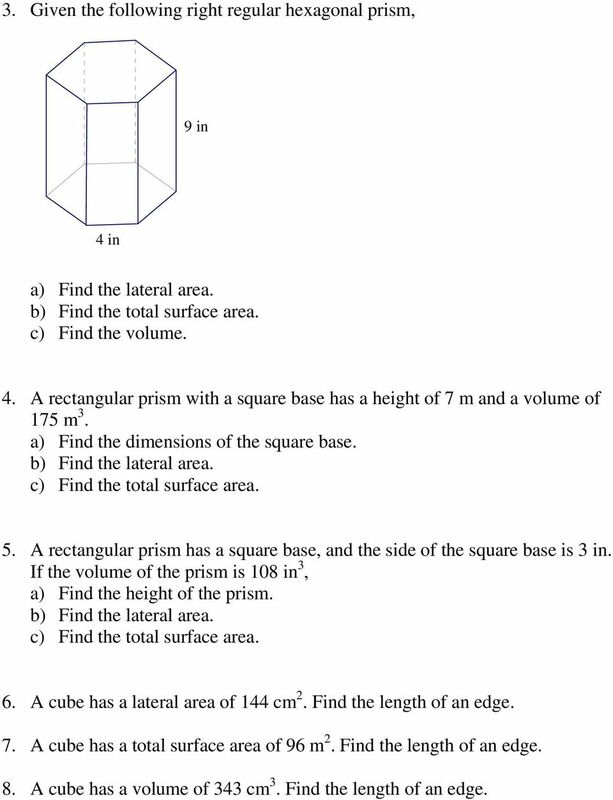 b) Find the lateral area and the total surface area of the prism, assuming that the 3x7 cm rectangles are the bases.. The following figure is a regular right prism. 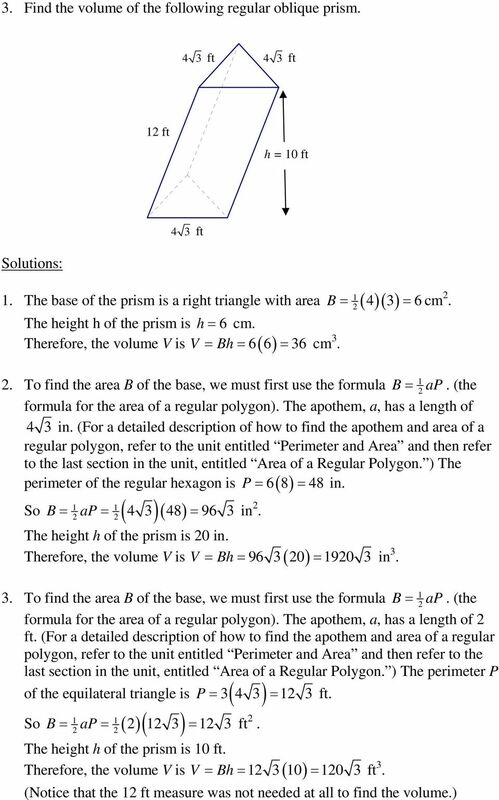 Find the lateral area and the total surface area of the prism. 0 in Solutions: 8 in. a) Assuming that the 3x5 cm rectangles are the bases: The perimeter P of a base is P = = 6 cm. The height h of the prism is 7 cm. L= Ph= 6 7 = cm. The lateral area of the prism is ( ) The area of a base is B = 35 ( ) = 5cm. The total surface area is T L B ( ) = + = + 5 = 4 cm. 9 Exercises Answer the following. Be sure to include units. (Figures may not be drawn to scale.). Given the following right triangular prism, 5 cm cm 0 cm a) Find the missing side length of the base. b) Find the lateral area. c) Find the total surface area. d) Find the volume.. Given the following right rectangular prism, 5 cm 7 cm 4 cm a) Find the lateral area. (Assume that the bases are the 4x7 cm rectangles.) b) Find the total surface area. 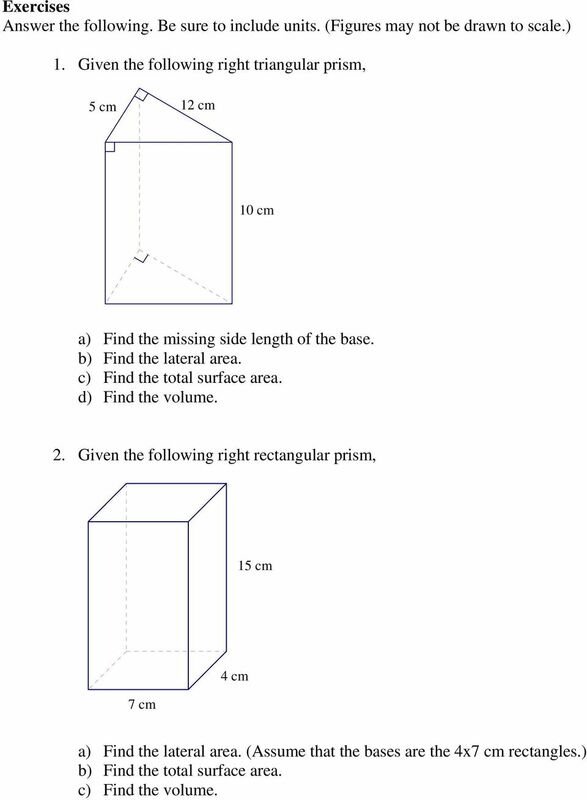 c) Find the volume. 10 3. Given the following right regular hexagonal prism, 9 in 4 in a) Find the lateral area. b) Find the total surface area. c) Find the volume. 4. A rectangular prism with a square base has a height of 7 m and a volume of 75 m 3. a) Find the dimensions of the square base. b) Find the lateral area. c) Find the total surface area. 5. A rectangular prism has a square base, and the side of the square base is 3 in. 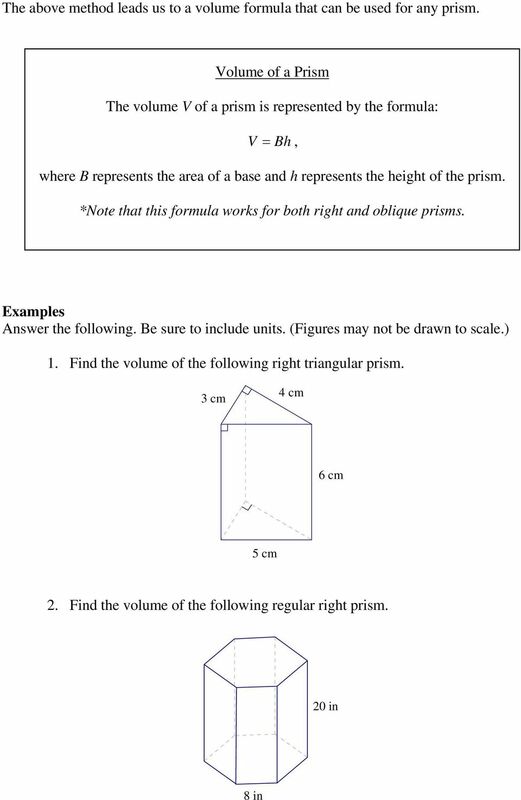 If the volume of the prism is 08 in 3, a) Find the height of the prism. b) Find the lateral area. c) Find the total surface area. 6. 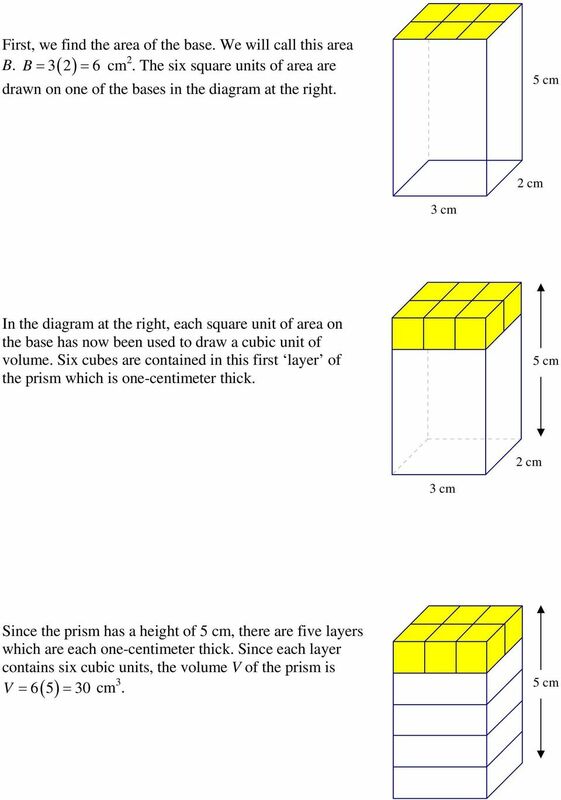 A cube has a lateral area of 44 cm. Find the length of an edge. 7. A cube has a total surface area of 96 m. Find the length of an edge. 8. A cube has a volume of 343 cm 3. Find the length of an edge. 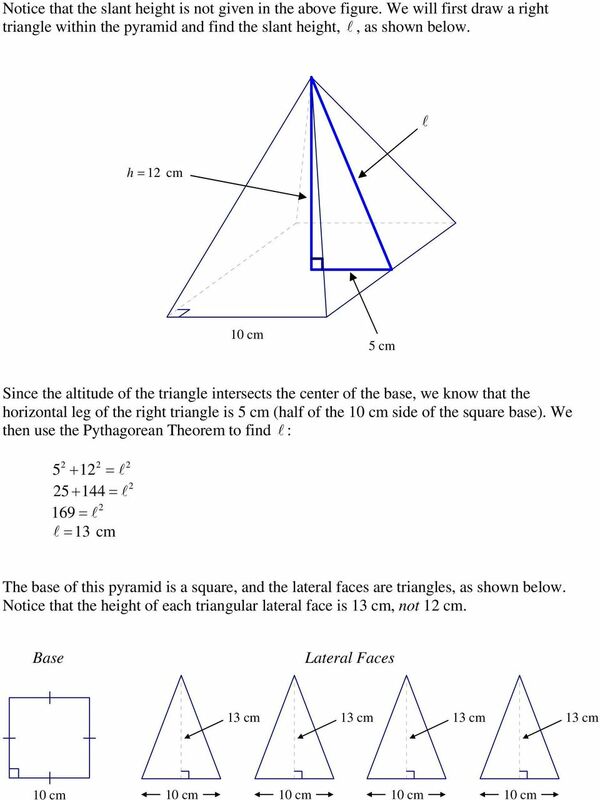 13 The lateral area of the square pyramid is the sum of the areas of the lateral faces; i.e. the sum of the areas of the four congruent triangles. 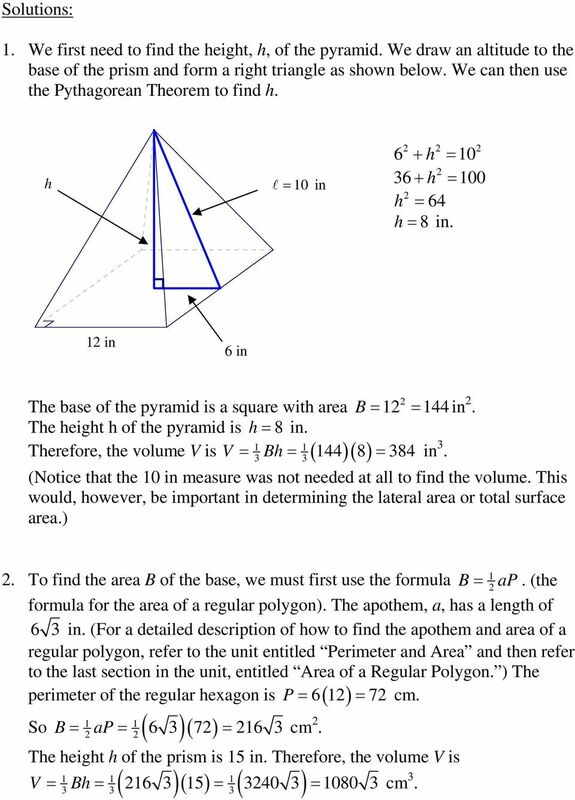 ( 0)( 3) ( 0)( 3) ( 0)( 3) ( 0)( 3) Lateral Area = = = 60 cm The lateral area of the pyramid is 60 cm. The total surface area of the pyramid is the lateral area plus the area of the base. Total Surface Area = Lateral Area + Area of Base = = = 360 cm The total surface area of the pyramid is 360 cm. 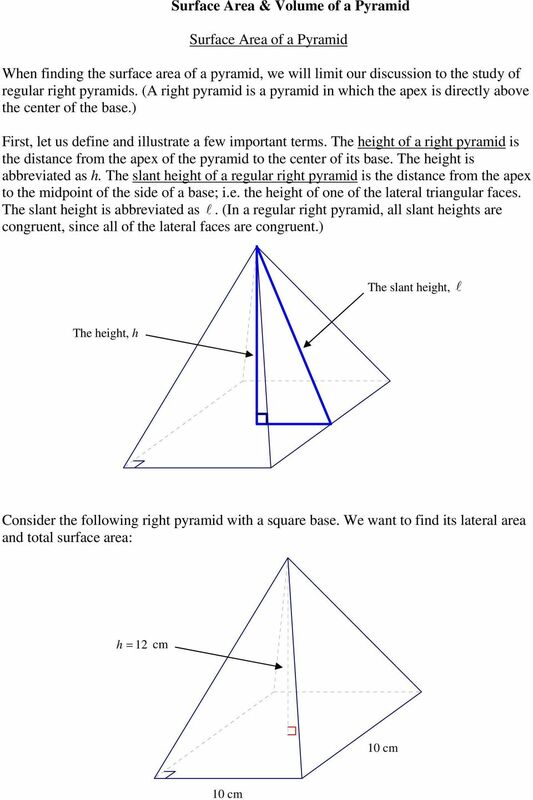 There is a shortcut for finding the lateral area of a regular right pyramid. In the equation for the lateral area, we will factor out ( 3 ) : ( 0)( 3) ( 0)( 3) ( 0)( 3) ( 0)( 3) ( 3)( ) Lateral Area = = In the formula above, ( ) represents the perimeter of the base, P, and 3 represents the slant height,. 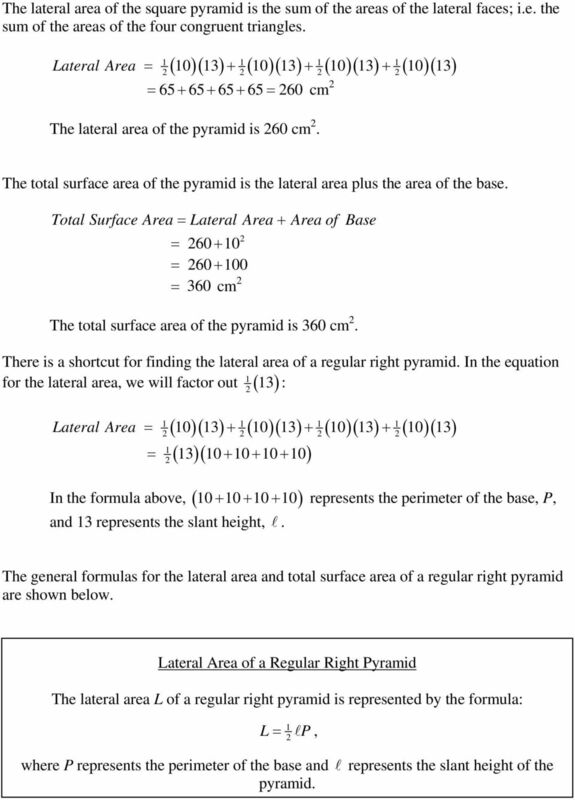 The general formulas for the lateral area and total surface area of a regular right pyramid are shown below. Lateral Area of a Regular Right Pyramid The lateral area L of a regular right pyramid is represented by the formula: L= P, where P represents the perimeter of the base and represents the slant height of the pyramid. 14 Total Surface Area of a Regular Right Pyramid The total surface area T of a regular right pyramid is represented by the formula: T = L+ B, where L represents the lateral area of the pyramid and B represents the area of the base. Volume of a Pyramid Suppose that we want to compare the volume of the following solids. The prism and the pyramid illustrated below have the same base and the same height. Suppose that we decide to fill the pyramid with sand and then pour it into the prism. We then continue this process until the prism is completely full of sand. 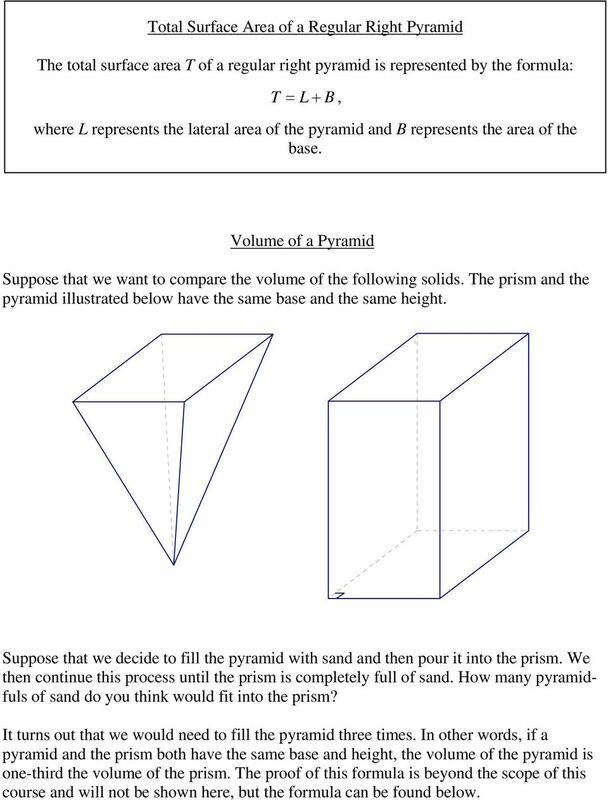 How many pyramidfuls of sand do you think would fit into the prism? It turns out that we would need to fill the pyramid three times. 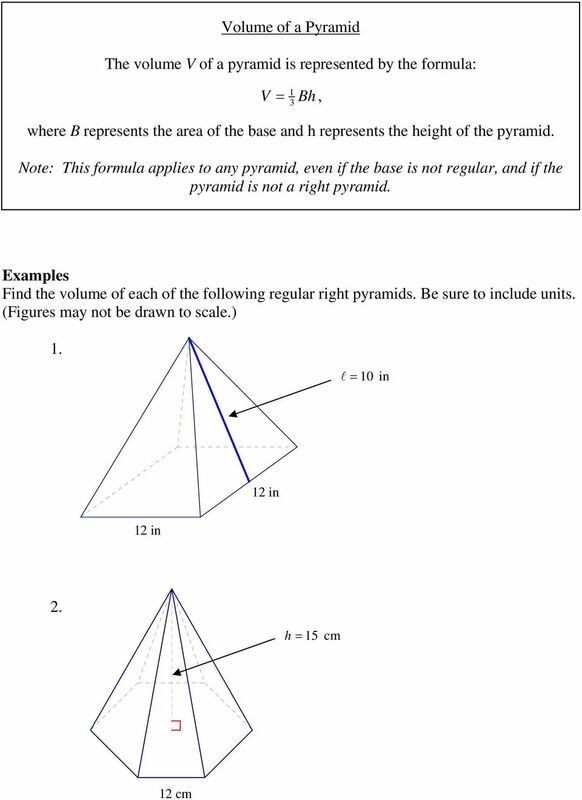 In other words, if a pyramid and the prism both have the same base and height, the volume of the pyramid is one-third the volume of the prism. The proof of this formula is beyond the scope of this course and will not be shown here, but the formula can be found below. 17 Exercises Answer the following. Be sure to include units. (Figures may not be drawn to scale.). Given the following right pyramid with a square base, = 5 in 4 in 4 in a) Find the lateral area. b) Find the total surface area. c) Find the volume.. Given the following regular right pyramid, = 0 in 6 in a) Find the lateral area. b) Find the total surface area. 18 3. 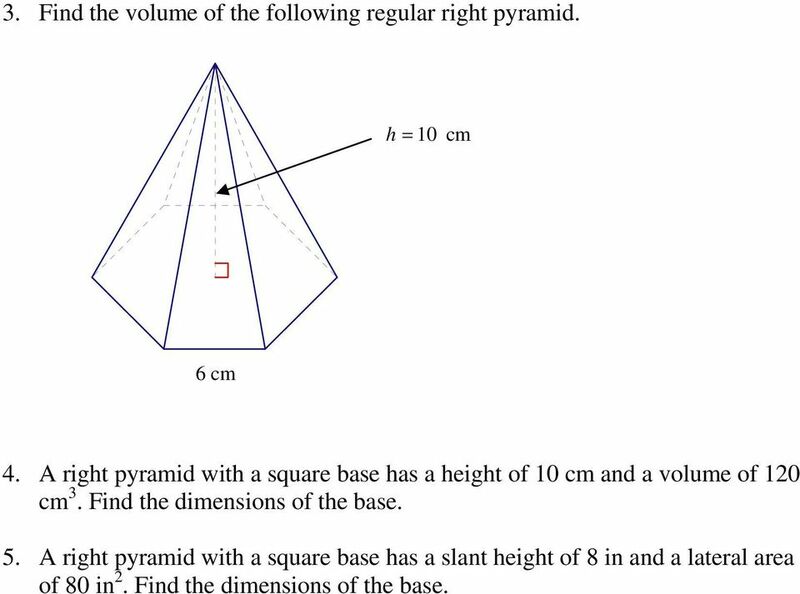 Find the volume of the following regular right pyramid. h = 0 cm 6 cm 4. A right pyramid with a square base has a height of 0 cm and a volume of 0 cm 3. Find the dimensions of the base. 5. A right pyramid with a square base has a slant height of 8 in and a lateral area of 80 in. Find the dimensions of the base. 19 Surface Area & Volume of a Cylinder A cylinder can be likened to a prism with a many-sided base. 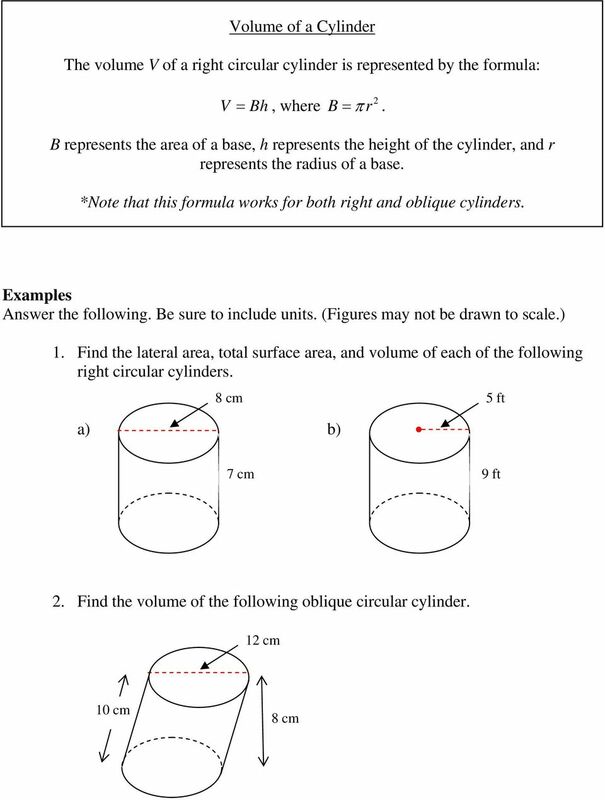 Because of this fact, the formulas for a cylinder are relatively easy to establish. When a formula for a prism calls for the perimeter of the base, we replace perimeter with circumference, as shown below. Formulas for a Prism Formulas for a Cylinder Lateral Area L = Ph L = Ch Total Surface Area T = L+ B T = L+ B Volume V = Bh V = Bh Since the bases of a cylinder are circles, we use the formula circle and C = π d = π r for the circumference of a circle. B = π r for the area of a The formulas for the lateral area, total surface area and volume of a cylinder can be found below. Lateral Area of a Right Cylinder The lateral area L of a right circular cylinder is represented by the formula: L= Ch, where C = π d = π r. C represents the circumference of a base, h represents the height of the cylinder, and d and r represent the diameter and radius of a base, respectively. Total Surface Area of a Right Cylinder The total surface area T of a right circular cylinder is represented by the formula: T = L+ B, where B = π r. L represents the lateral area of the cylinder, B represents the area of a base, and r represents the radius of a base. 21 Solutions:. a) From the diagram of the cylinder, we can see that d = 8 cm and h = 7 cm. We first find the circumference, C: C = π d = π 8= 8π cm We can now find the lateral area, L: L= Ch= 8π 7= 56π cm Since d = 8 cm, then r = 4 cm. We then compute the area of the base, B: B= πr = π 4 = 6π cm Next, we compute the total surface area, T: T = L+ B= 56π + 6π = 56π + 3π = 88πcm Finally, we compute the volume, V: 3 V = Bh= 6π 7 = π cm b) From the diagram of the cylinder, we can see that r = 5ft and h = 9ft. We first find the circumference, C: C = π r = π 5= 0π ft We can now find the lateral area, L: L= Ch= 0π 9 = 90π ft We then compute the area of the base, B: B= πr = π 5 = 5π ft Next, we compute the total surface area, T: T = L+ B= 90π + 5π = 90π + 50π = 40πft Finally, we compute the volume, V: 3 V = Bh= 5π 9 = 5π ft. From the diagram of the cylinder, we can see that d = cm and h = 8 cm. Since d = cm, then r = 6 cm. We then compute the area of the base, B: B= πr = π 6 = 36π cm We can then find the volume, V: 3 V = Bh= 36π 8 = 88π cm Exercises Answer the following. Be sure to include units.. A right circular cylinder has a radius of 0 in and a height of 4 in. a) Find the lateral area. b) Find the total surface area. c) Find the volume. 22 . A right circular cylinder has a diameter of 4 in and a height of 9 in. a) Find the lateral area. b) Find the total surface area. c) Find the volume. 3. A right circular cylinder has a diameter of 5 m and a height of 6 m. a) Find the lateral area. b) Find the total surface area. c) Find the volume. 4. A right circular cylinder has a height of 5 in and a volume of a) Find the radius. b) Find the lateral area. c) Find the total surface area. 3 45π in. 5. A right circular cylinder has a diameter of 6 cm and a lateral area of 9π cm. a) Find the height b) Find the total surface area. c) Find the volume. 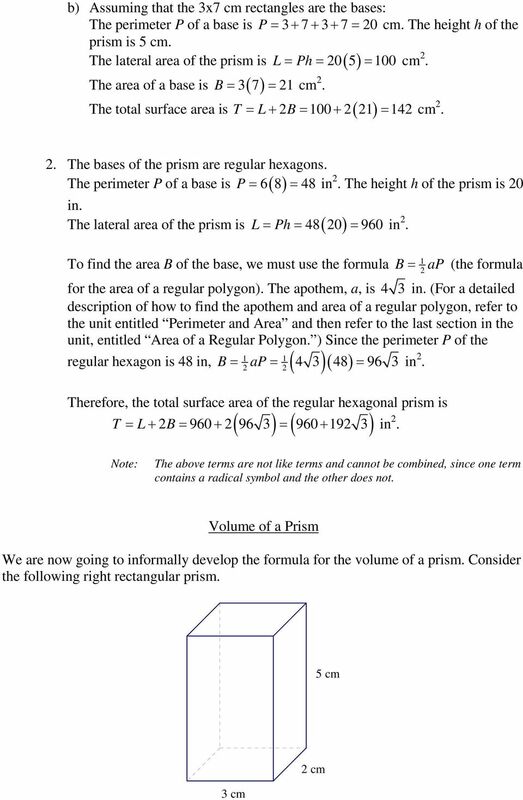 23 Surface Area & Volume of a Cone Just as the formulas for a cylinder were similar to those of a prism, the formulas for a cone are similar to those of a pyramid. When a formula for a pyramid calls for the perimeter of the base, we replace perimeter with circumference, as shown below. Formulas for a Pyramid Formulas for a Cone Lateral Area L= P L= C Total Surface Area T = L+ B T = L+ B Volume V = Bh V = Bh 3 3 Since the base of a cone is a circle, we use the formula and C = π d = π r for the circumference of the circle. B = π r for the area of the circle The formulas for the lateral area, total surface area and volume of a cone can be found below. Lateral Area of a Right Cone The lateral area L of a right circular cone is represented by the formula: L= C, where C = π d = π r. C represents the circumference of the base, represents the slant height of the cone, and d and r represent the diameter and radius of the base, respectively. Total Surface Area of a Right Cone The total surface area T of a right circular cone is represented by the formula: T = L+ B, where B = π r. L represents the lateral area of the cone, B represents the area of a base, and r represents the radius of a base. 26 . From the diagram of the cone, we can see that r = 8 ft and h = ft. We then compute the area of the base, B: B= πr = π 8 = 64π ft We can then find the volume, V: 704 V = Bh= 64π = π ft ( )( ) Exercises Answer the following. Be sure to include units in your answer.. A right circular cone has a radius of 7 cm and a slant height of 5 cm. a) Find the lateral area. b) Find the total surface area. 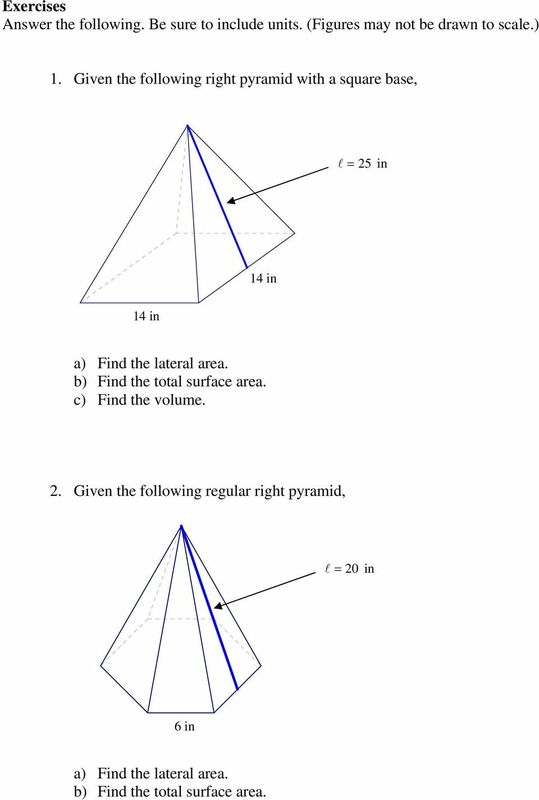 c) Find the volume.. A right circular cone has a diameter of 4 ft and a height of 5 ft. a) Find the lateral area. b) Find the total surface area. c) Find the volume. 3. A right circular cone has a radius of 5 in and a lateral area of a) Find the slant height. b) Find the height. c) Find the total surface area. d) Find the volume. 4. A right circular cone has a diameter of 8 in and a volume of a) Find the height. b) Find the slant height. c) Find the lateral surface area. d) Find the total surface area. 35π in. 08π in.